Yesterday’s signals were not triggered as there was no bearish price action at 1.2923. Go long following a bullish price action reversal on the H1 time frame immediately upon the next touch of 1.2828. I wrote yesterday there should still be some medium-term bearish pressure weighing the price down, but if the price could get established above 1.2923 as the London session got underway, that would be a mildly bullish sign. It was likely to be the day’s pivotal level. That wasn’t a bad call as the price spiked above it but immediately reversed back below, and then continued to move down, o the level was pivotal. The medium-term bearish trend continues, and the Pound is now looking weaker than the Euro, which is a bearish sign for this pair. 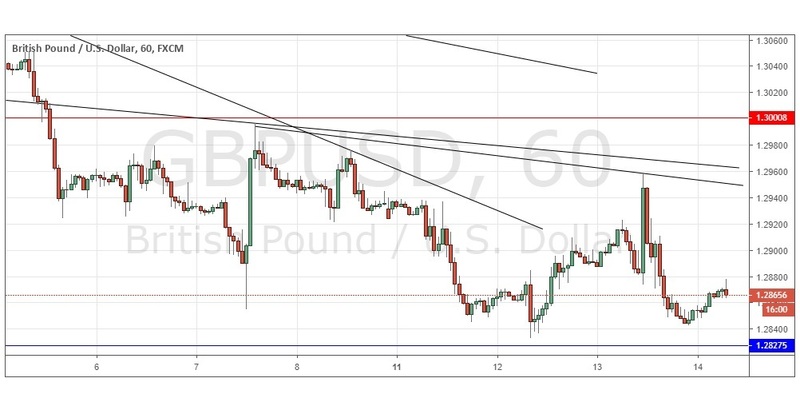 I see the support at 1.2828 as likely to be the pivotal level today and would take a bearish bias if the price trades below it for a couple of hours. There is nothing of high importance due today regarding the GBP. Concerning the USD, there will be releases of Retail Sales and PPI data at 1:30pm London time.